Objective: To understand the development, intent, and consequences of US tobacco industry advertising for low machine yield cigarettes. Methods: Analysis of trade sources and internal US tobacco company documents now available on various web sites created by corporations, litigation, or public health bodies. Results: When introducing low yield products, cigarette manufacturers were concerned about maintaining products with acceptable taste/flavour and feared consumers might become weaned from smoking. Several tactics were employed by cigarette manufacturers, leading consumers to perceive filtered and low machine yield brands as safer relative to other brands. Tactics include using cosmetic (that is, ineffective) filters, loosening filters over time, using medicinal menthol, using high tech imagery, using virtuous brand names and descriptors, adding a virtuous variant to a brand's product line, and generating misleading data on tar and nicotine yields. Conclusions: Advertisements of filtered and low tar cigarettes were intended to reassure smokers concerned about the health risks of smoking, and to present the respective products as an alternative to quitting. Promotional efforts were successful in getting smokers to adopt filtered and low yield cigarette brands. Corporate documents demonstrate that cigarette manufacturers recognised the inherent deceptiveness of cigarette brands described as “Light”or “Ultra-Light” because of low machine measured yields. The first Surgeon General's report on smoking in 1964 reawakened public concerns about the potential health consequences of smoking. Tobacco manufacturers needed to reduce these consumer concerns and anxious feelings to protect their sales and profits. Quitting was not an easy or appealing option for smokers since nicotine is highly addictive, so for many smokers, switching to a lower yield cigarette became an attractive alternative once assured by advertising that so doing was a meaningful step towards health and away from risk. Thus, there was a ready market for “new and improved” cigarettes, or at least for those that seemed “new and improved”. Within this paper, we review recently released documents from the tobacco industry and its consultants for insights into the firms' thinking and actions in marketing their products over the past 50 years. The KBM Group, a contractor for the US National Cancer Institute, acted as the primary source of internal industry documents. A listing of available documents concerning low machine yield cigarettes was provided to the authors, and documents were selected for further review on the basis of relevance (according to title and subject descriptors such as marketing, advertising, consumer behaviour, and specific cigarette brand names). Using similar selection criteria, additional industry documents were accessed from the web sites created by Physicians for a Smoke-Free Canada, the Roswell Park Cancer Institute, and Anne Landman's Daily Document service. Roughly 150 separate industry documents were reviewed, all of which have been indexed and archived at the History of Advertising Archives at the University of British Columbia, Vancouver, Canada. Within this chronological review, particular attention is paid to the period of the mid 1970s when most of the current generation of low yield products were launched. Cigarette advertising during the 1950s portrayed filters as the technological fix to health concerns. These were heralded with various dramatic announcements featuring “news” about scientific discoveries, modern pure materials, research and development breakthroughs, implied endorsement from the American Medical Association (fig 1), “miracle tip filters”, descriptions of “20,000 filter traps” or filters made of activated charcoal, “selectrate”, “millecel”, and “cellulose acetate” or “micronite” that were variously described as effective, complete, superior, and producing mildness, gentleness, smoothness, etc. Kent: implied American Medical Association endorsement (circa 1953). 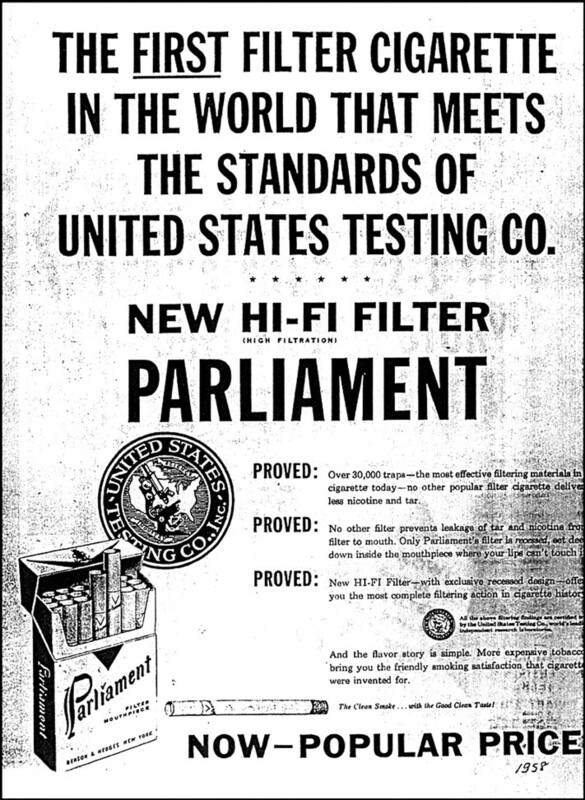 The 1958 advertising for Parliament boasted that it “meets the standards of the United States Testing Co” (fig 2). The ad showed the official seal of the organisation which included a microscope and was readily perceived as acceptance by a government agency, although in fact it was by a private firm. Parliament: endorsement of United States Testing Co (1958). 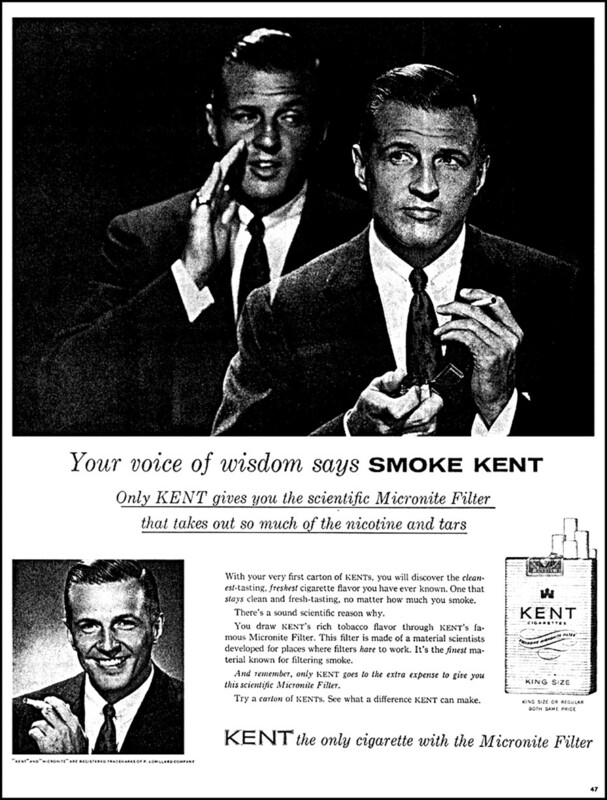 The period from the mid 1950s until the mid 1960s was tumultuous for the industry, with many new filter products launched, many competitive advertising claims using different standards of measurement, changing Federal Trade Commission (FTC) guidelines about what was or was not permitted in cigarette advertising, and occasional news about research findings affecting the marketplace. Intense rivalry regarding claims and counter-claims about cigarette yields were dubbed the “tar derby” or “tar wars” within the trade. 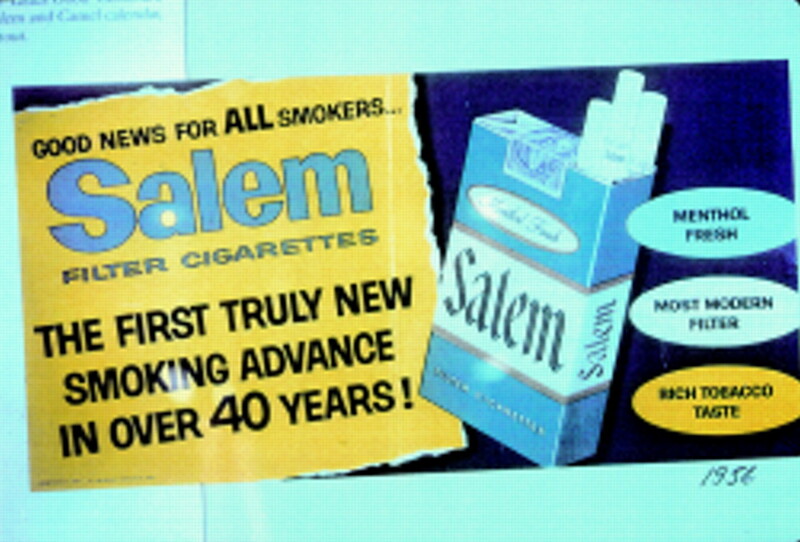 Salem: “First Truly New Smoking Advance” (1956). Philip Morris anticipated that women would be the largest potential market for a “health cigarette” following the release of the 1964 Surgeon General's report.15 Consumer research conducted for Brown & Williamson (B&W) recognised consumers' addiction psychology, as well as their conflicts, guilts, anxieties, and needs for reassurance. “While unquestionably smokers are concerned about the tar and nicotine contents and the filtration effectiveness of their brands, nevertheless, both on the surface and even to some extent unconsciously, they appear to be resisting open involvement with this `frightening' element of smoking”.17 Some brands were less successful than others when trying to address consumer conflicts directly. Kent, for example, used a visual portrayal of a smoker's conscience, and thus risked being experienced as guilt inducing rather than guilt reducing (fig 4). Kent: “Voice of Wisdom” (1955). In order to provide a “foundation upon which marketing and advertising executions can be built”, Lorillard did a market segmentation analysis which identified clusters of consumers with similar psychologies. The consumer segment most appropriate for Kent was described in substantial and subtle psychological detail. Despite the label of “social conformist”, the central concern of these smokers was health consequences. Philip Morris had seen the competitive value of a so-called “health cigarette” following the first Surgeon General's report on cigarettes in 1964. Over the course of the next 12 years Philip Morris worked on such a product, culminating in the 1976 product launch of the Merit brand. One key tactic was to “enrich” the product by applying extensive efforts in flavour chemistry and additives (fig 5). Philip Morris seemed proud of the fact that they had managed this while using “less than 100 flavorants”.44 While the advertising did boast about the product being “enriched”, it did not disclose any of these less than 100 flavouring chemicals to consumers. 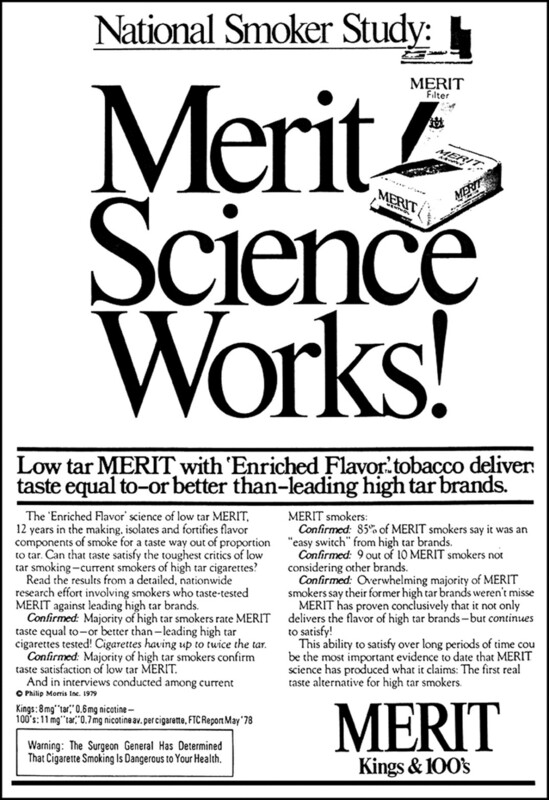 “Merit Science Works—Enriched Flavour” (1979). The market launch strategies gave particular emphasis to the choice of the name Merit, obviously communicating apparent virtue, and an advertising style that made this product development seem eminently scientific and newsworthy and less like an ad. The product launch strategy included a record level of advertising investment. “Introducing Fact. The low gas, low `tar'”. “I'm realistic. I only smoke Facts”. “There are many reasons to smoke Now” (1976). During all of this promotional activity, many consumers considered, tried, and even switched to the nominally lower yield products, and did so primarily in pursuit of better health. When asked if and why some brands were thought to be better for health, smokers showed that they had bought the idea that the nominally low yields were meaningful. The reassurance of apparent low yields led many to switch rather than quit. 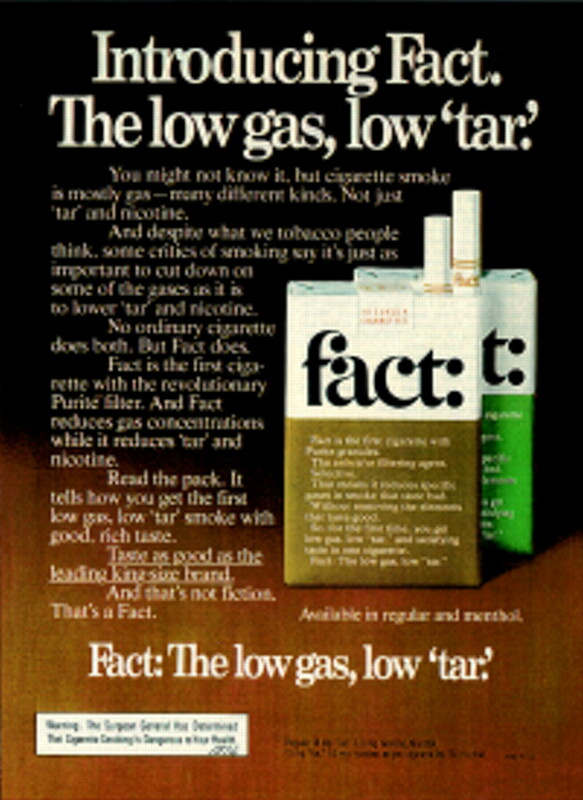 “It is useful to consider lights more as a third alternative to quitting and cutting down—a branded hybrid of smokers' unsuccessful attempts to modify their habit on their own”.68 “In point of fact, smoking an ultra low tar cigarette seems to relieve some of the guilt of smoking and provide an excuse not to quit”.69 True's campaign in the 1970s spoke directly to the desire to quit, portraying quitting and smoking True as equivalent alternatives (fig 10). With the FTC yield data providing apparent accreditation, consumers were likely to perceive yield numbers as valid and meaningful, and so thought the industry. When B&W brought the Barclay product to market in 1981, it did so with an ad campaign calling the product 99% tar free. The product's structure generated phenomenally low yield data in the FTC test. This caused alarm among B&W's competitors, who petitioned the FTC for help, and in doing so disclosed their awareness that the FTC testing procedure was flawed and the yield data invalid for human smokers. 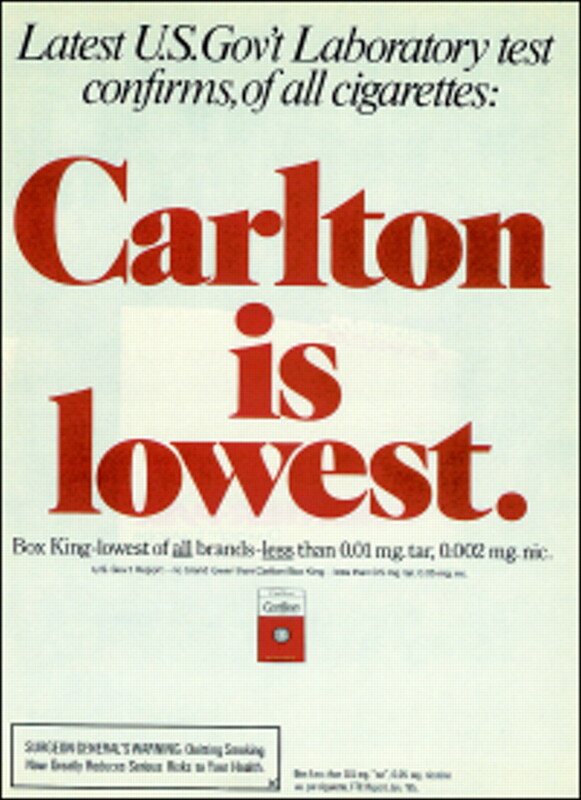 A very desirable brand image was created for Carlton, especially by ads promoting Carlton in a hard box, emphasising its very low machine yield numbers (fig 11). Unfortunately, consumers purchasing Carlton in the store typically acquired soft packs. Although consumers might well have expected that they were getting the identical product in a different box, it was in fact a very different product. Carlton Box “phantom brand” (1985). Consumer research sought an ever more subtle understanding of smokers' psychology. 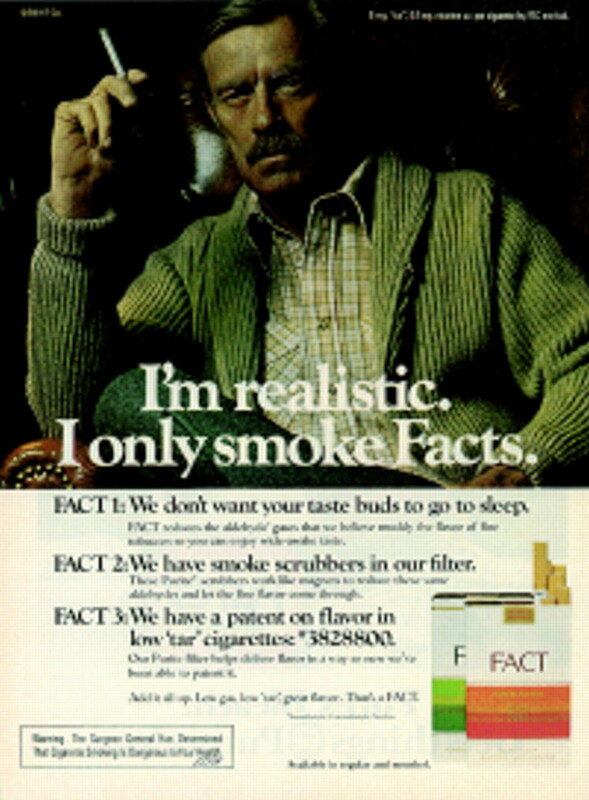 RJR commissioned in-depth psychological research from Social Research, Inc in 1982 to closely compare the smokers of Vantage and Merit on the basis of their smoking histories, beliefs about the filter, and other responses to advertising, and their personalities. In-depth interviews delved into the psychological subtleties of respondents with detailed discussion centred on their comparative personality structures. 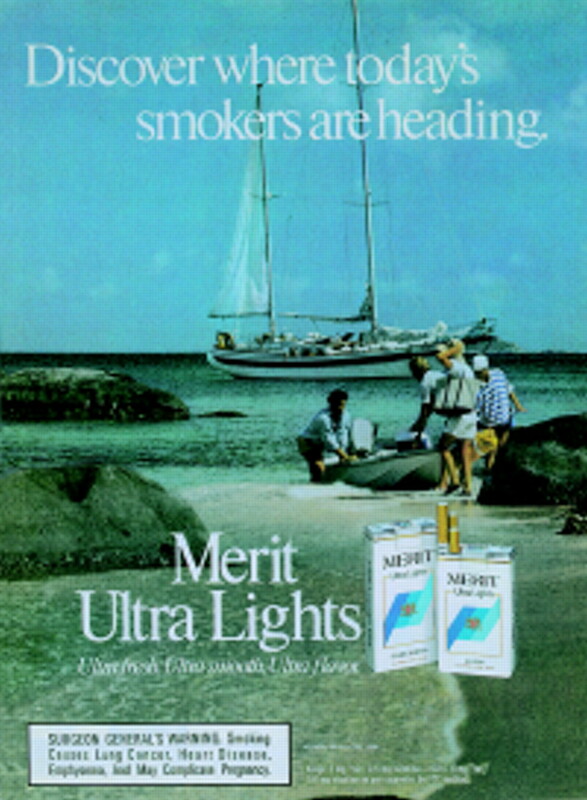 Merit Ultra Light “sea” campaign (1986). 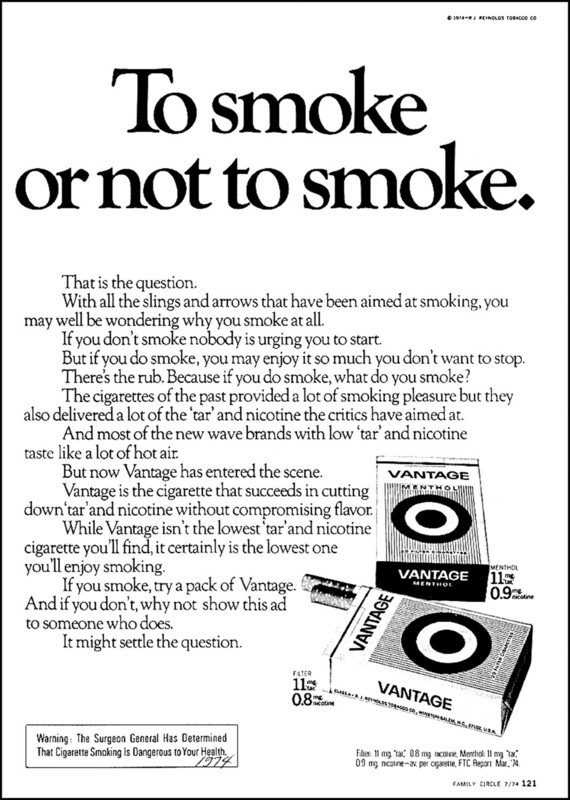 Vantage “To smoke or not to smoke” (1974). 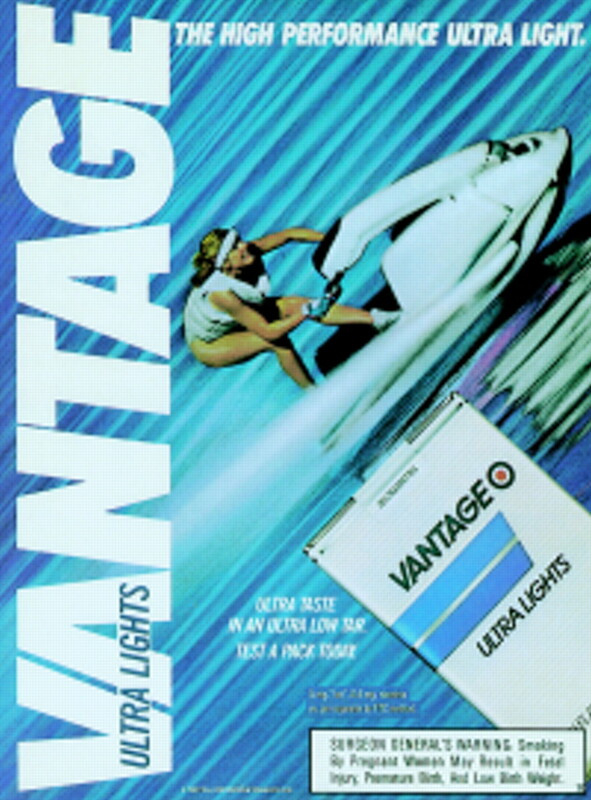 By 1986, Vantage was targeting a younger audience and sought to create an image of being “energetic, action oriented” (fig 14). Because “the appeal is purely visual, making the photography the most critical element of almost every campaign”, they hired a photographer to “bring out the high energy and supersaturated color we wanted . . . [in] a bold graphic statement”. The campaign showed solo “athletes involved in risky, high action, non-team sports . . . the ads suggest VANTAGE smokers lead high energy life styles”.84 The preshoot planning took months to scout location and select talent. The photographic shoot required a staff of 25, working over three tightly scheduled days, starting at dawn, and shooting from helicopters. All models wore red to emphasise pack colours. Vantage “energetic action” photography (1987). Cigarette advertising is notoriously uninformative, with characteristic forms using veiled health implications and pictures of health along with vague promises of taste and satisfaction.88 Occasionally ads for new technological developments called attention to the filter design with allusions to its effectiveness, yet nearly always remained unspecific about what constituents of tobacco or its smoke were being filtered and what health/safety consequences were warranted. Only the machine yield tar and nicotine information is given, and presented as if rich with implications. 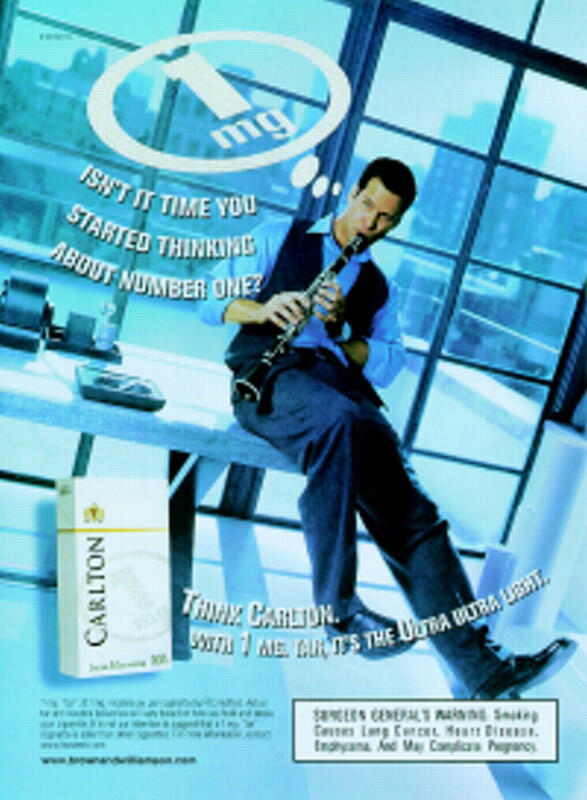 For example, smokers are now encouraged to “start thinking about number 1” and use Carlton Ultra Ultra Light (fig 15). Carlton “Thinking about Number 1” (1999). The cigarette industry has not voluntarily utilised advertising to inform consumers in a consistent and meaningful way about any of the following: (1) the technologies employed in fabricating the products; (2) the constituents added in the manufacturing processes; (3) the residues and contaminants that may be present in the combustible column; (4) the constituents of smoke that may be hazardous; (5) the addictiveness of nicotine; or (6) the health risks to which its regular consumers and anyone surrounding them are inevitably exposed. Rather, advertising for low yield products has relied on pictures of health and images of intelligence, misleading consumers into believing that filtered products in general, and low tar products in specific, are safe(r) relative to other brands. Thus, it is not surprising that most consumers show ignorance of even the most basic characteristics of the smoke they consume. Nicotine is a design feature of cigarette products, and an essential design feature (a “sine qua non”). Corporate documents reflect the industry's fear of consumers becoming weaned from smoking if not maintained with sufficient nicotine. Products which fail to deliver adequate nicotine satisfaction and “taste” experience risk being rejected by consumers. Consumer knowledge, beliefs, attitudes, opinions, and behaviour have been routinely and extensively studied by the industry and the firms it has hired (that is, market research firms, motivation researchers, and ad agencies). Health concerns of a serious nature have been present among some smokers since at least the 1950s. Women, older, and more highly educated smokers have long been more likely to manifest health concerns. The ramifications of these health concerns are anxieties, conflicts, shame, and guilt leading to a need for reassurance from advertising. In the 1950s, the promotion of filters provided consumer reassurance with very explicit verbal representations about the health protection being offered. Once the nominal purpose of filtration was well understood by the consumer public, the healthfulness of filters was represented in more implicit means, using thinly veiled language (for example, “hospital white” filters, “Alive with Pleasure”) and visual “pictures of health” (that is, lively behaviour and/or pristine environments). The “image” or “illusion of filtration” is essential to the selling of cigarettes, whereas the fact of filtration is not. Consumer (smoker) opinion and perceptions are what governs their behaviour, not the medical or technological facts known to manufacturers and experts. Using cosmetic ineffective filters. Some brands relied on the credibility of filters established by the pioneering brands, and offered products with filters that were essentially cosmetic, without notable efficacy. Using medicinal menthol. Menthol was introduced into some products to capitalise on its “pseudo-health” benefit, a consumer perception derived from experiencing menthol elsewhere in the medicinal context of cough and cold remedies. Loosening filters. 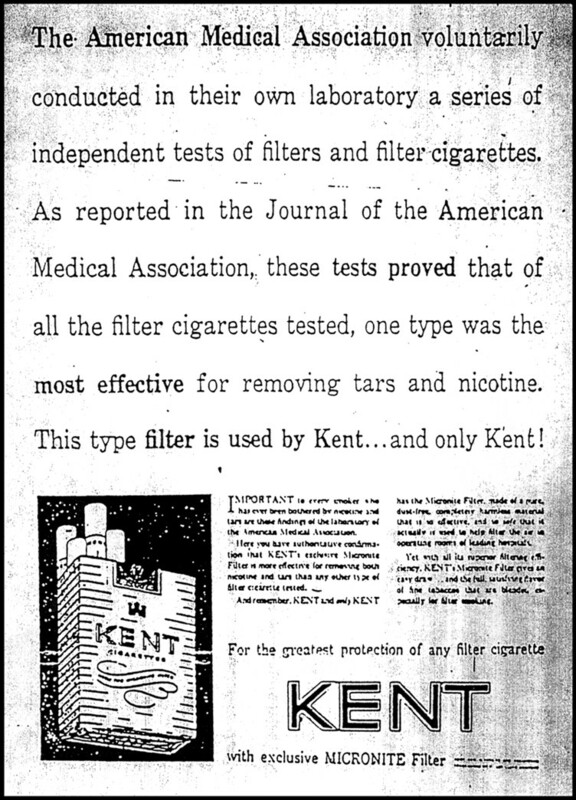 Once established in the public's mind as having effective filtration, Kent offered several successive generations of product in the 1950s and 1960s that were seemingly “new and improved”, yet in fact delivered ever more tar and nicotine. Using high tech imagery. New filters were presented that seemed to be the fruits of scientific research (that is, technologically innovative), such as charcoal filters, dual filters, chambered filters, recessed “safety zoned” filters, gas trap filters, etc. Promotions for these products rarely specified the hazardous elements being filtered. Using virtuous brand names and descriptors. Brands were given names to imply state-of-the-art technology and/or a virtuous product (for example, Life, Merit, Now, True, or Vantage). Product variations became described in technically meaningless, but seemingly virtuous, descriptors like “Mild”, “Ultra”, “Light”, or “Super-Light”. Adding a virtuous product to a product line. Some product lines had wide ranging tar and nicotine deliveries in the same brand family. The best of these was used for advertising purposes to reassure consumers while selling other product varieties. When the best product variant was featured in ads but rarely sold in the stores, it was described by competitors as a “phantom brand”. Fooling the machines and using the data to fool smokers. Filters and cigarette papers were developed starting in the 1950s which “air conditioned” the smoke, diluting the smoke column with side stream air. When smoked by machines, as in FTC tests, low tar and nicotine numbers resulted, desirable for promotional purposes, but higher yields were obtained by real people, desirable in satisfying nicotine addiction. The testing of products by official government agencies, like the FTC, provides the industry with credibility, and data that proves useful for promotional purposes. Low yield cigarettes were heavily promoted. Promotional programmes for cigarettes have been lavishly funded in general, with advertising in multiple media. A disproportionate amount of this funding promoted low yield products when they were introduced in the 1970s. Little or no meaningful information is contained in cigarette promotion about the product, its ingredients and additives, the technology of filtration, the hazardous constituents of smoke, or the health consequences of smoking. Consumer ignorance and confusion has been persistent over decades. While smokers that switch to low yield brands manifest faith in their relative healthfulness, few consumers know the true delivery characteristics of the brands they smoke. Even their general impressions are not too accurate. Cigarette advertising addresses both the smoker's ego/status needs, as well as the need for health reassurance. Successful advertising creates brand imagery which affects self perceptions and the social symbolism of smoking. Successful advertising also maintains the illusion of healthfulness, without being so obvious as to provoke anxieties and defensiveness, and sustains “faith and confidence in the smoking habit”. Marketing activities (that is, product design, packaging, PR, retail activities, etc) and advertising have proven essential to maintaining the financial vitality of the cigarette industry by maintaining the apparent vigour of the cigarette product. Images have succeeded while facts have failed. Cigarette advertising has successfully created the “impression” or “illusion” of healthfulness, while relying primarily on visual images of lifestyles, implications of social status, and healthfulness. Consumers, with too few facts provided to guide them, cannot make truly informed decisions. Previous research has examined internal tobacco industry documents to provide summary evidence of the marketing and research agendas of various tobacco manufacturers. The widest attention has been directed toward the importance of youth as a “starter market”. 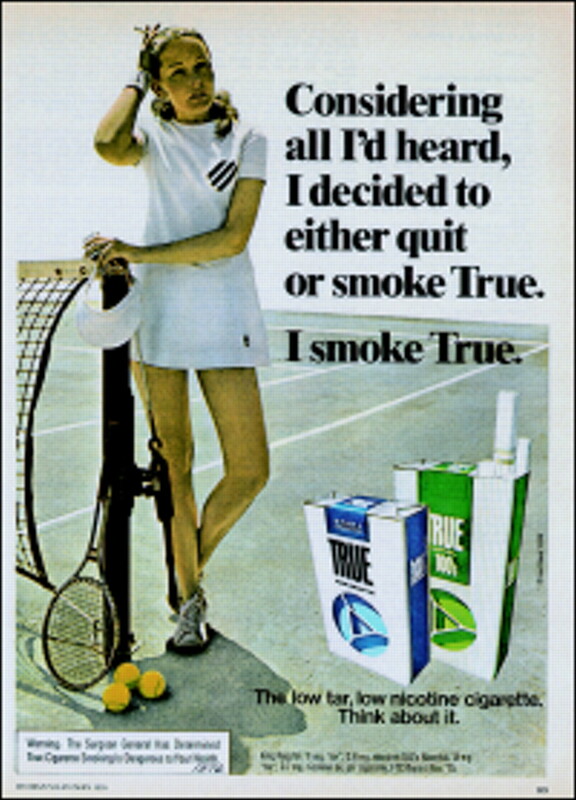 This historical analysis of trade press and internal industry documents focuses on the development, intent, and consequences of US tobacco industry advertising for low machine yield cigarettes. 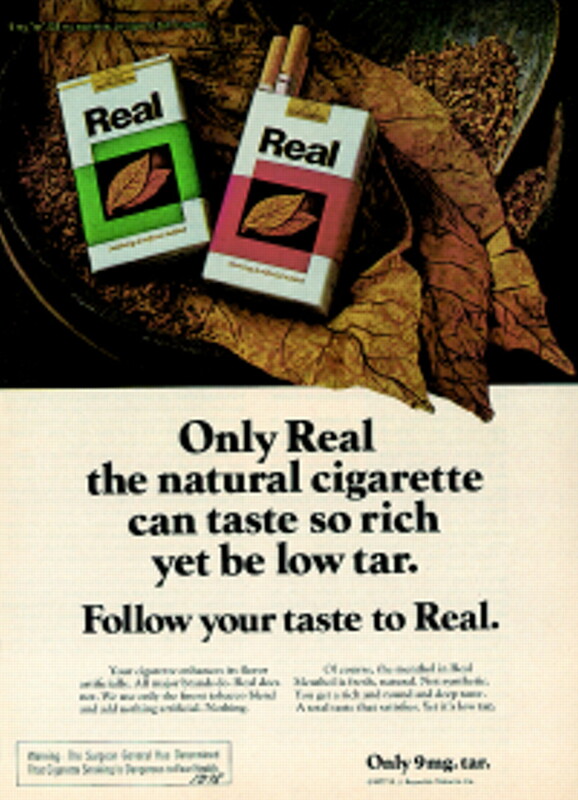 Our analysis reveals that over the past 50 years advertisements of filtered and low tar cigarettes were intended to reassure the many smokers who were anxious about the health risks of smoking. The findings add credence to the claim that brand descriptors such as “Mild”, “Light”, and “Ultra-Light”are deceptive and misleading to consumers, and thus need to be addressed by public policy initiatives. Timothy Dewhirst is a recipient of a National Health PhD Fellowship from Health Canada/Canadian Institutes of Health Research. Pollay RW. Promotion and policy for a pandemic product: notes of the history of cigarette advertising (US). Tobacco Litigator's Bookshelf1989;4.7 TPLR:6.30–6.79. Whelan EM. A smoking gun: how the tobacco industry gets away with murder. Philadelphia: Geo. Stickley, 1984:90. Pollay RW. Filters, flavors . . .flim-flam, too! : cigarette advertising content and its regulation. Journal of Public Policy and Marketing1989;8:30–9. Johnston Jr ME. Market potential of a health cigarette. Special report no. 248. Philip Morris document June 1966:16. Bates No. 1000338663. Federal Trade Commission. Trade regulation rule for the prevention of unfair and deceptive advertising and labelling of cigarettes in relation to the health hazards of smoking and accompanying statement of basis and purpose of rule. Washington DC: FTC, 22 June 1964: 72. Oxtoby-Smith Inc. A psychological map of the cigarette world. Prepared for Ted Bates and Brown & Williamson. August 1967:26. Produced in Texas AG litigation, TAG #777152146. O'Keefe AM, Pollay RW. Deadly targeting of women in promoting cigarettes. Journal of the American Medical Women Association1996;51:67–9. Abrams T, Crist P, Kaczynski S, et al. Undated attorney work product. Prepared for Jones, Day, Reavis & Pogue. Brown & Williamson document. Bates No. 681879254/715. Latimer FE. Cigarette advertising history. Brown & Williamson document, 29 November 1976:5. Bates No. 680086043. Blatnik J. Making cigarette ads tell the truth. Harper's Magazine August1958;217:45–9. Chambers RL. U.S. cigarette history. Brown & Williamson document, 21 September 1979: np. Bates No. 660110385-660110386. Cunningham & Walsh. Kool: 1933-1980. A retrospective view of Kool. Brown & Williamson document 10 November 1980:9. Bates No. 676019314. Wakeham H. Smoking and health: significance of the report of the Surgeon General's committee to Philip Morris Incorporated. Philip Morris Research Center. 18 February 1964:8. Bates No. 1000335622. Johnston Jr ME. Market potential of a health cigarette. Special report no. 248. Philip Morris document June 1966:1. Bates No. 1000338648. Oxtoby-Smith Inc. A psychological map of the cigarette world. Prepared for Ted Bates and Brown & Williamson. August 1967:6, 14, 23. Bates No. 777152126, 777152134, 777152143. Alex Gochfeld Associates Inc. The present competitive position of Pall Mall Gold 100's and Silva Thins: a motivational research study. Prepared for The American Tobacco Company. March 1969:9. Produced in Minnesota litigation, available at http://www.bw.aalatg.com. Kieling RF. Implications for Kent. Director of Market Research. 31 August 1964:3–5. Bates No. 01140938-01140940. Johnston Jr ME. Market potential of a health cigarette. Special report no. 248. Philip Morris document June 1966:1–2, 5. Bates No. 1000338648, 1000338649, 1000338652. Teague CE. Proposal of a new, consumer-oriented business strategy for RJR tobacco company. 19 September 1969:9–10. Bates No. 500915709-500915710. Anon. The product in the early 1980s. BAT Co document. 29 March 1976:2. Bates No. 110069975. Tindall JE. A new low delivery segment. Philip Morris USA Research Center. 22 May 1973:16. Bates No. 1002473802. Schori TR. Tar, nicotine and smoking behavior. Philip Morris USA. Research Center. November 1971:1. Bates No. 2062951584. Teague CE. Research planning memorandum on the nature of the tobacco business and the crucial role of nicotine therein. RJR document. 14 April 1972:3 Document or Bates No. 7578. Dickerson JP, Woods JD. Low “tar” cigarette prototype. RJR Inter-office memorandum. 19 February 1975:2. Bates No. 504208704. Fitzgerald CW, Senkus M, Laurene A, Kecseti FM (presenters). New product/merchandising directions: a three year action plan. RJR document. 19 August 1976:1, 38. Bates No. 501143244, 501143259. Oldman M. Products/consumer interaction. BAT Co document. 19 May 1981:2. Bates No. 109383263. Anon. Purite filter. Brown & Williamson document ∼1977:4, 13. Bates No. 777076771, 777076780. Marketing and Research Counselors, Inc. What have we learned from people? A conceptual summarization of 18 focus group interviews on the subject of smoking. 26 May 1975:9. Bates No. 670171228. Oxtoby-Smith Inc. A psychological map of the cigarette world. Prepared for Ted Bates and Brown & Williamson. August 1967:24–5. Bates No. 777152144-777152145. DeGarmo Inc. Research Department. Conclusions and implications of True portfolio research. Prepared for Lorillard. August 1974: np. Bates No. 03374671. Hind JF, Fitzgerald CW, Ritchy AP. New brand orientation for Ogilvy & Mather, Inc. RJR document. 10 August 1976:63. Bates No. 501143762. Marketing and Research Counselors, Inc. What have we learned from people? A conceptual summarization of 18 focus group interviews on the subject of smoking. 26 May 1975:2. Bates No. 670171221. Anon. Merit history (script for slide presentation). Philip Morris document. 17 August 1990:13–14. Bates No. 2500114499-2500114500. Anon. Young adult smoker life styles and attitudes. Prepared for Brown & Williamson. 1974:2, 7. Bates No. 680109281, 680109286. O'Toole JE. The trouble with advertising. New York: Chelsea, 1981:94–5. The Roper Organization Inc. A study of smokers' habits and attitudes with special emphasis on low tar cigarettes. Prepared for Philip Morris USA. May 1976:14. Bates No. 2022207319. Kalhok AI, Short PL. The effect of restrictions on current marketing on marketing in the future. Brown & Williamson document May 1976:8. Bates No. 680040475. Anon. Year 2000. BAT Co document. Exhibit 11,350, State of Minnesota and Blue Cross and Blue Shield of Minnesota v. Philip Morris, Inc, et al. 4 April 1979:1. Bates No. 109883101. Kalhok AI, Short PL. The effect of restrictions on current marketing on marketing in the future. Brown & Williamson document May 1976:11. Bates No. 680040478. Marketing and Research Counselors, Inc. What have we learned from people? A conceptual summarization of 18 focus group interviews on the subject of smoking. 26 May 1975:1–2, 5, 12–13. Bates No. 670171220-670171221, 670171224, 670171231-670171232. Anon. Concerned segment: long term strategic marketing analysis. RJR document. 27 March 1986:41. Bates No. 515112989. Anon. The product in the early 1980s. BAT Co document. 29 March 1976:6. Bates No.110069979. John J, Wakeham H. Breakthrough of the high taste, low tar cigarette—a case history of innovation. Philip Morris Research Center. 1977:8. Bates No. 2024824163. John J, Wakeham H. Breakthrough of the high taste, low tar cigarette—a case history of innovation. Philip Morris Research Center. 1977:13–14. Bates No. 2024824168-2024824169. Anon. Merit history (script for slide presentation). Philip Morris document. 17 August 1990:4. Bates No. 2500114502. Anon. Brand report 12: cigarettes. Media Decisions1976;11:148. Anon. Brand report 12: cigarettes. Media Decisions1976;11:146. Anon. Brand report 23: cigarettes. Media Decisions1977;12:152. Anon. Purite filter. Brown & Williamson document ∼1977:1. Bates No. 777076768. Anon. Brand manager in the hot seat. Media Decisions1978;13:68. Anon. Brand report 23: cigarettes. Media Decisions1977;12:154. Porter JH. The last cigarette advertisement. New York State Journal of Medicine1985;85:359. Fitzgerald CW, Senkus M, Laurene A, Kecseti FM (presenters). New product/merchandising directions: a three year action plan. RJR document. 19 August 1976:91. Bates No. 501143279. Fitzgerald CW, Senkus M, Laurene A, Kecseti FM (presenters). New product/merchandising directions: a three year action plan. RJR document. 19 August 1976: np. Bates No. 501143266. Crittenden A. $40 million for a real smoke. The New York Times, 15 May 1977: Sec. 3, 1ff. Hind JF, Fitzgerald CW, Ritchy AP. New brand orientation for Ogilvy & Mather, Inc. RJR document. 10 August 1976:40. Bates No. 501143747. Anon. Camel Lights marketing background. RJR document: np Bates No. 505254243-505254283. Anon. Winston Light 100's promotion plan. RJR document: 261. Bates No. 503406611. Anon. Brand report 23: cigarettes. Media Decisions1977;12:150. Anon. Triumph planning seminar: competitive advertising. Lorillard document. 25 February 1980: np Bates No. 89923112. Anon. Purite filter. Brown & Williamson document ∼1977:14. Bates No. 777076781. Cunningham & Walsh. Kool: 1933-1980. A retrospective view of Kool. Brown & Williamson document. 10 November 1980:55. Bates No. 676019361. Koten J. Tobacco marketers' success formula: make cigarets [sic] in smoker's own image. Wall Street Journal, 29 February 1980:22. Anon. What are the obstacles/enemies of a swing to low “tar” and what action should we take? Exhibit 26,185, State of Minnesota and Blue Cross and Blue Shield of Minnesota v. Philip Morris, Inc., et al. 2 July 1982:2–3. Bates No. 680592165-680592166. The Roper Organization Inc. A study of smokers' habits and attitudes with special emphasis on low tar cigarettes. 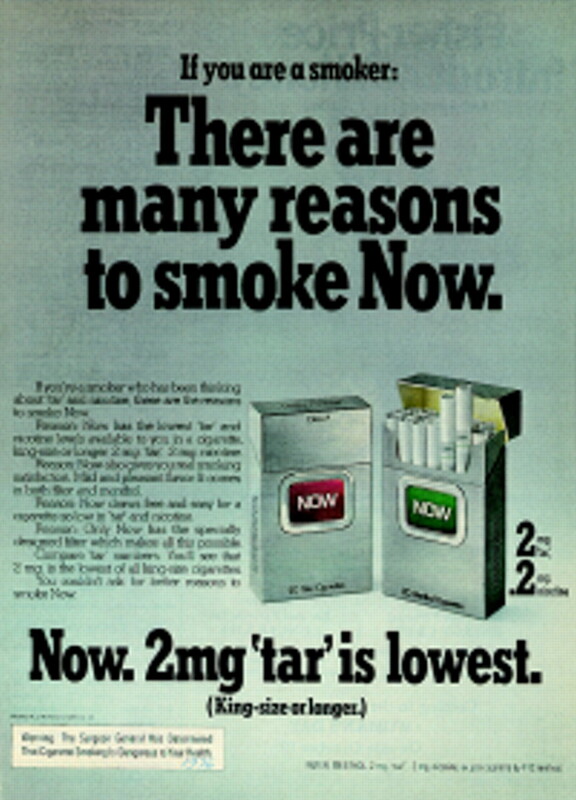 Prepared for Philip Morris USA May 1976:3, 19–20. Bates No. 2022207308, 2022207324-2022207325. Goldstein/Krall Marketing Resources, Inc. A qualitative exploration of smoker potential for a new entry in the ultra low tar market category (two focused group interviews). Prepared for Philip Morris. January 1979: np Cover page Bates No. 2040066741, available at http://www.smokescreen.org/tdoc/dispPage....0%22tar%22&HideComment=YES&parentID=38252. Anon. R&D/marketing conference. BAT Co document ∼1985:9, 13. Bates No. 100501589, 100501593. Goldstein/Krall Marketing Resources, Inc. A qualitative exploration of smoker potential for a new entry in the ultra low tar market category (two focused group interviews). Prepared for Philip Morris. January 1979:12. Bates No. 2040066754. Spears A. Untitled (re: costs of making tobacco products). Lorillard document. Exhibit 14,009, State of Minnesota and Blue Cross and Blue Shield of Minnesota v. Philip Morris, Inc, et al. 13 November 1973: 2–3. Bates No. 80634636-80634637. Fitzgerald CW, Senkus M, Laurene A, Kecseti FM (presenters). New product/merchandising directions: a three year action plan. RJR document. 19 August 1976: 46 Bates No. 501143263. Hind JF, Fitzgerald CW, Ritchy AP. New brand orientation for Ogilvy & Mather, Inc. RJR document. 10 August 1976:60. Bates No. 501143760. Brown & Williamson. Partial document re: why people start and continue smoking, smokers, needs, reasons and brand imagery. Brown & Williamson document. No Date Cited: np. Produced in Texas AG litigation, TAG #679011027ff. Latimer FE. Cigarette advertising history. Brown & Williamson document. 29 November 1976:1–2. Bates No. 680086039-680086040. Short PL. Smoking & health item 7: the effect on marketing. BAT Co document. Exhibit 10,585, State of Minnesota and Blue Cross and Blue Shield of Minnesota v. Philip Morris, Inc, et al. 14 April 1977:1, 3. Bates No. 100427792, 100427794. Anon. Philip Morris, Inc. v. Loew's Theatres, Inc., 511 F. Supp. 855 (SDNY 1980). Reynolds JH, Norman AB, Robinson JH. Possible consequences of failure of the FTC to act against the Barclay cigarette filter and its mimics. RJR Interoffice Memo. 4 March 1982:1. Bates No. 503670658. Pepples E. Low-”tar” cigarette advertising and the FTC cigarette testing program: a time for re-examination. Brown & Williamson Memo. 9 June 1982:4. Document or Bates No. 41342. Levy SJ, Robles AG. Vantage and Merit smokers. Social Research, Inc. (Prepared for RJR). April 1982:90. Bates No. 502097547. Anon. Presentation to Hamish Maxwell. Philip Morris document. 19 November 1985. Bates No. 2023177690-2023177691. Anon. Merit history (script for slide presentation). Philip Morris document. 17 August 1990:9, 11. Bates No. 2500114503, 2500114505. Pollay RW. Targeting youth and concerned smokers: evidence from Canadian tobacco industry documents. Tobacco Control2000;9:136–47. Kaplan M. Inside advertising: perfect match. American Photographer October 1986:100–2. Wakeham H. Smoking and health: significance of the report of the Surgeon General's committee to Philip Morris Incorporated. Philip Morris Research Center. 18 February 1964:6. Bates No. 1000335620. Pepples E. Industry response to cigarette health controversy. Brown & Williamson Memo. 4 February 1976:8. Bates No. 779063900, Available at http://www.library.ucsf.edu/tobacco/docs/html/2205.01/2205.01.5.html. Pepples E. Low-”tar” cigarette advertising and the FTC cigarette testing program: a time for re-examination. Brown & Williamson Memo. 9 June 1982:1. Document or Bates No. 41342. US Department of Health and Human Services. Preventing tobacco use among young people. A report of the Surgeon General, 1994. Atlanta, Georgia: Public Health Service, Centers for Disease Control and Prevention, Office on Smoking and Health, 1994. (US Government Printing Office Publication No S/N 017-001-00491-0.):179–84. Miles M. 4 A's advertisement. The New York Times, 24 November 1992:16.